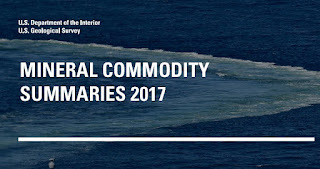 USGS Mineral Commodity Summaries 2017 – How did Arizona fare? 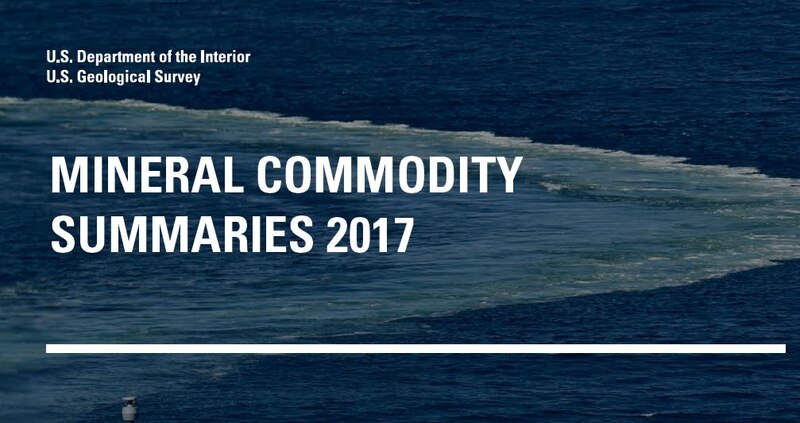 The US Geological Survey just released their Mineral Commodity Summaries 2017, detailing mineral production in the U.S. in 2016. How did Arizona fare? Arizona' total non-fuel mineral production in 2016 was $ 5,560 million, 7.45% of U.S. total. Principal minerals, in order of value included: copper, sand and gravel (construction), molybdenum concentrates, cement (portland), stone (crushed). Once again, Arizona led the U.S. in copper production, with significant increase in copper production at Freeport-McMoRan's Morenci Mine. In terms of gemstones production, Arizona tracked second in the U.S. behind Idaho. Arizona placed 7th in sand and gravel for construction production. The U.S. Geological Survey just released a report indicating that elevated uranium concentration in spring water north of Grand Canyon is NOT the result of nearby uranium mining activity. Elevated concentrations are instead likely due to natural sources and not to past mining at the nearby Pigeon Mine. Figure 2. New earth fissure trending north-south in the center of the frame. The sharp contrast in fissure geometry, from open, with a width and depth of 10s of feet, to a closed, crack-like feature, is apparent. (Photo by B. Gootee). 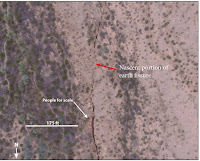 A fresh, ~ 2-mile long earth fissure occurs 10 miles south-southwest of Picacho Peak State Park on Arizona Trust Land in southern Pinal County (Figure 1a & b.). This new fissure, which is oriented roughly north-south, parallels other fissures in the Tator Hills Earth Fissure Study area. Fissures at Tator Hills were first observed in 1977, and by 2009 over 11 miles of fissures were mapped there. The width and depth of the new fissure varies dramatically along its length; from a narrow, inch-wide crack to a shallow crevice up to 10 feet wide and 25- to 30-feet deep. 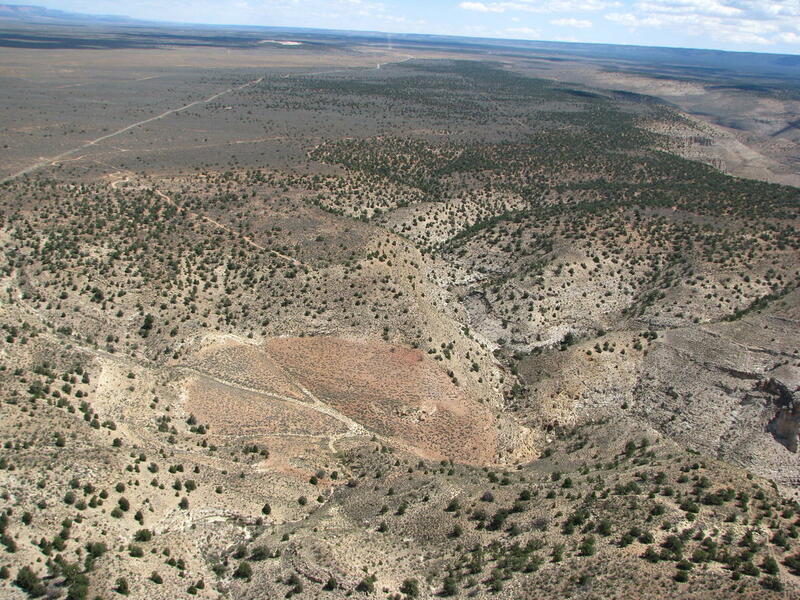 At 1.8 mile in length, this newest fissure is more than a ½-mile longer than other area fissure. Unlike older fissures in the Tator Hills, this fissure is free of vegetation, commensurate with having formed over just the past several years. Comparing dated Google Earth imagery, AZGS Earth Fissure program manager, Joe Cook, determined the fissure began to form between Mar. 2013 and Dec. 2014. The onset of fissuring began in the north before extending southward and may have coincided with heavy rains in fall 2014. The southern portion of the fissure postdates the Dec. 2014 imagery. Fissure Drone Video. On 19 Jan. 2017, AZGS’ Brian Gootee and Joe Cook, along with Arizona Dept. 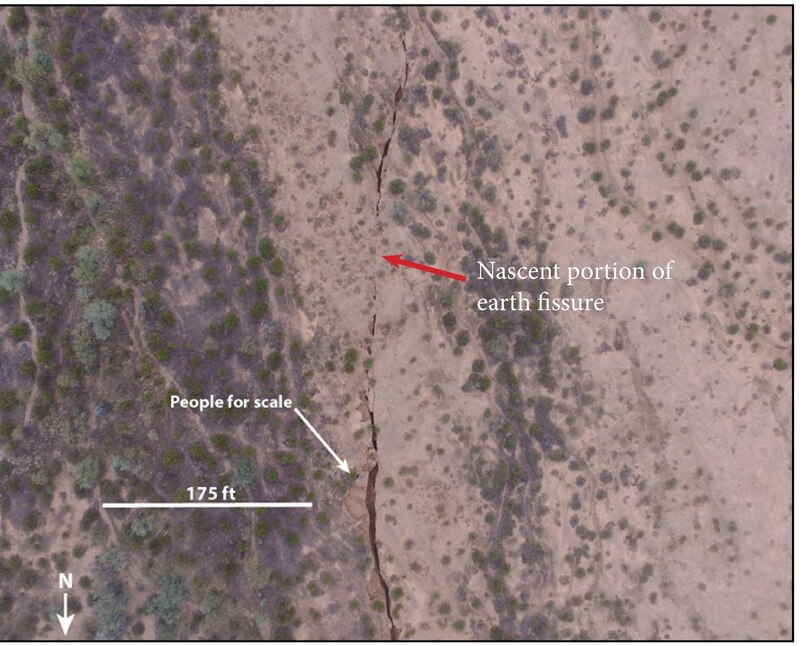 of Water Resources’ Brian Conway, captured the first drone video of a fresh earth fissure in Arizona (Figure 2, VIDEOS URL). The two videos illustrate the variable geometry (width and depth) and overall fresh appearance of the fissure. Geohazard! In urban areas earth fissures pose a substantial threat to infrastructure – homes, building, roads and bridges. In rural areas, fissures threaten roaming livestock and individuals recreating in off-road and 4-wheel drive vehicles. 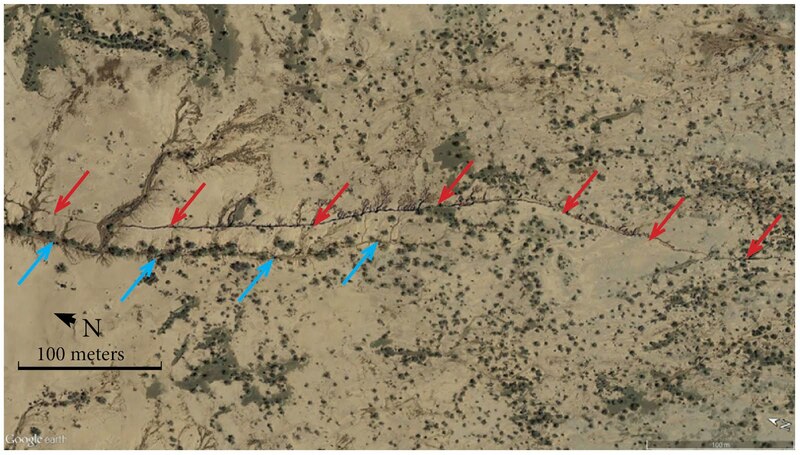 Fissure sidewalls are precipitous, unstable, and prone to sudden collapse that could snare an unwary observer standing on the collapsing edge (Figure 3). Figure 3. 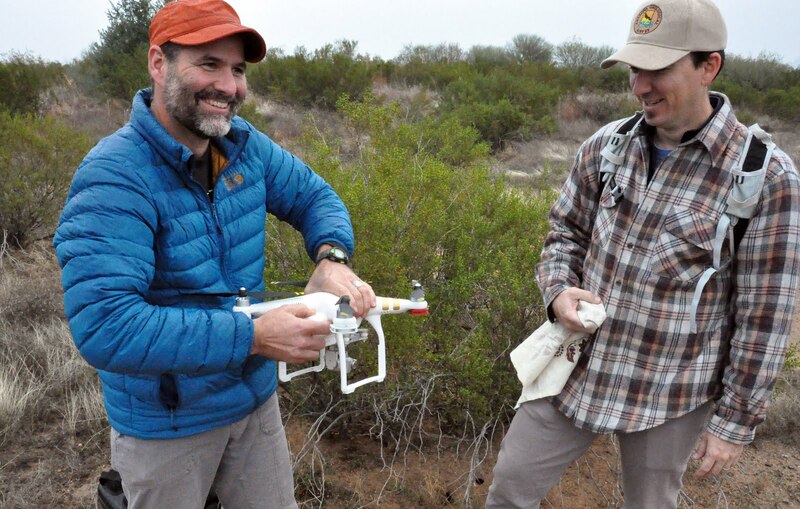 AZGS geoscientists Brian Gootee, drone operator, and Joe Cook, earth fissure mapping program director launching the first drone-fissure exercise. Photo by B. Conway (ADWR). Arizona Geological Survey, 2009, Earth Fissure Map of the Tator Hills Study Area: Pinal County, Arizona: Arizona Geological Survey Digital Map - Earth Fissure Map 11 (DM-EF-11), map scale 1:24,000. Natural Hazards in Arizona Viewer: an interactive map tool illustrating the distribution of earth fissures in south-central and southeastern Arizona. 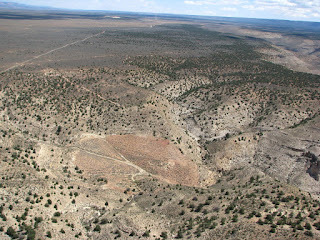 Slaff, S., 1993, Land Subsidence and Earth Fissures in Arizona. Arizona Geological Survey Down-to-Earth #3, 30 p.